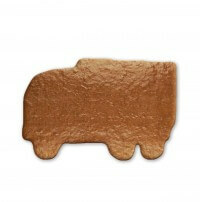 The blank gingerbread with the form of a truck can easily be labeled and decorated with up to 45 letters. With icing powder and food coloring, you can create the right works of art. Let your creativity run wild! After the crafting fun delicious gingerbread can be eaten. But you can also give away your creation - and do a truck fan a great favor.